This calendar will update with your phone calendar to your wall calendar so you and your family can keep track of each others meetings and appointments! We built this application using python, google api console, and google oauth authentication protocols. We uploaded all of our code with github, and integrated it with our snapdragon board. 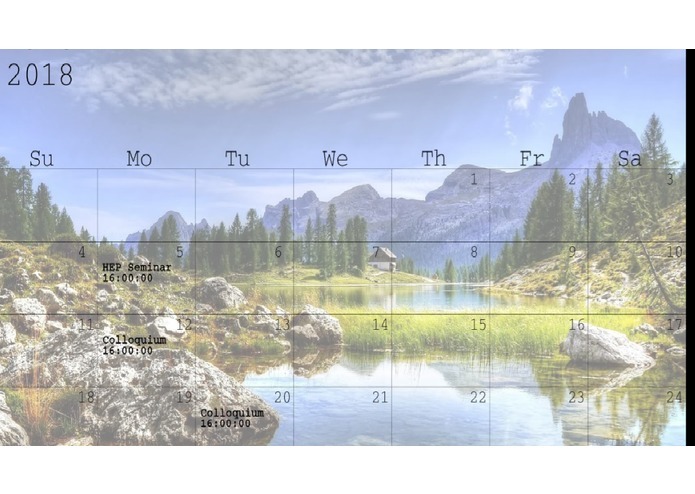 The biggest challenges we ran into were troubles connecting the snapdragon board to the internet to get our calendar files, also populating a grid with dates in the appropriate spaces alongside populating each box with the appointment and dates in a well-spaced manner. We are very proud of creating a functional application that updates in real time with your google drive calendar within the day time limits. We learned how to get information for a Google drive api, learned how to create a calendar gird in python and populate with parsed inputs, we also learned how to integrate with the snapdragon board. we would like to have an easily switch-able calendar and to add events directly from the wall calendar to phone.